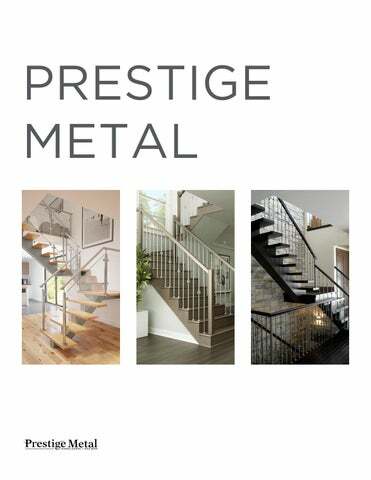 PRESTIGE METAL IS A QUÉBEC COMPANY SPECIALIZED IN THE DESIGN AND MANUFACTURE OF STAIR RAILINGS, STRINGERS, NEWEL POSTS, BALUSTERS AND INDOOR STAIRWAY ACCESSORIES. FIRMLY FOCUSED ON INNOVATION AND THE MASTERY OF TECHNOLOGIES, ITS STAIRCASE CREATIONS AND COLLECTIONS HAVE PROPELLED IT TO THE RANK OF CANADIAN LEADER AND SUPPLIER OF CHOICE. IN THIS SECTION, WE SUGGEST VARIOUS METHODS FOR INSTALLING ORNAMENTAL IRON AND STAINLESS STEEL BALUSTERS. *Photos and drawings are indicative. The installer is responsible for checking the current regulations, in their area, with their local building inspector. OVER THE YEARS, WE HAVE DEVELOPED AN ORIGINAL LINE OF STYLISH COLORS AND FINISHES OF OUTSTANDING QUALITY AND DURABILITY. MOST OF OUR METAL PRODUCTS ARE AVAILABLE IN ALL COLORS AND FINISHES. Powder coat is heat cured to high intensity. It covers uniformly and hides traces of welding and sanding. Durable, scratch-resistant finish. Powder coated base with a handpainted patina finish applied with an irregular brush and covering app. 40% of the surface. Zinc powder coated base coat to resist corrosion, then finished with electrostatic powder-coated paint for a glossy sheen. We apply our colors according to a traditional patina method which involves hand-wiping in ­irregular strokes over a powder coated base layer. This handcrafted method allows for a ­natural variations from one baluster to the next for a beautifully ­authentic effect. *Photos and drawings are indicative. Not available in GU 48h. *ZXM 03F, SMR 350 and SMR 350V handrail supports are available with the flat mounting plate. The necessary tools to install Prestige Metal stainless steel systems are available for sale. GUIDELINE THIS IS A PRACTICAL REFERENCE GUIDE THAT LISTS ALL OUR BALUSTERS BY SERIES AND CATEGORY. THIS TOOL WILL HELP YOU CHOOSE FROM OUR SELECTION OF PRODUCTS. * Not available in Exterior Black (NX). Note that balusters ordered in Exterior Black (NX) do not come with screw caps. Photos and drawings are indicative. The installer is responsible for checking the current regulations, in their area, with their local building inspector. * Not available in Exterior Black (NX). Note that balusters ordered in Exterior Black (NX) do not come with screw caps. Photos and drawings are indicative. The installer is responsible for checking the current regulations, in their area, with their local building inspector. * Not available in Exterior Black (NX). Note that balusters ordered in Exterior Black (NX) do not come with screw caps. Photos and drawings are indicative. The installer is responsible for checking the current regulations, in their area, with their local building inspector. Timeless beauty, with warmth and style, that appeals to all ages, a classic tradition of harmony, simplicity and durability. Young, modern, and distinctive: a blend of materials, unique shapes, and eyecatching details. Flowing curves for a sophisticated ambiance. •	Wood species : birch, maple and oak. •	Before staining, a final sanding is advised. •	Standard shoe included. Refer to the Accessories section for more shoe options (additional charge applies). •	Available in every color except NX and SS. •	B 010 : Only the upper stem varies. •	B 012 : Pattern varies according to baluster’s height. *Since the spindle is hammered, the size may vary. •	Standard shoe included. Refer to the Accessories section for more shoe options (additional charge applies). •	Available in every color except NX and SS. •	Square spindle hammered on 4 sides (TD series). •	Standard shoe included. Refer to the Accessories section for more shoe options (additional charge applies). •	Available in every color except OR, AR, CR, NX and SS. •	Glass thickness : 1/8" •	GT 010 kneewall : All other measurements are available only on special order (additional charge applies), contact customer service. 36 ¾" I 40 1/2" 44 1/2"
•	Standard shoe included. Refer to the Accessories section for more shoe options (additional charge applies). •	Available in every color except NX and SS. •	Recommended for the front of the tread. 36 ¾" I 40 1/2"
28" I 32" 44 1/2"
•	Standard shoe included. Refer to the Accessories section for more shoe options (additional charge applies). •	Available in every color except NX and SS. •	H 015A-2 : Not available in 28'' for kneewall. •	Standard shoe included. •	Available in every color except NX and SS. •	The pattern is centered for kneewall heights. •	H 032 : Not available in 31" and in 28" for kneewall. •	Standard shoe included. •	Available in every color except NX and SS. •	Pattern varies according to baluster’s height. •	See available starting post: PH 091. •	The pattern is centered for kneewall heights. •	H 090 : Same features as the H 091. For a pattern with a central line in the staircase, use a 36 3/4" and a 40 1/2". •	Irregular round hammered spindle (HE series). •	Standard shoe included. •	Available in every color except SS. •	The pattern is centered for kneewall heights. •	H 01E-2 : Not available in 31" and in 28" for kneewall. •	Irregular round hammered spindle (HG series). •	Standard shoe included. •	Available in every color except SS. •	H 011G : Not available for kneewall. •	The pattern is centered for kneewall heights. •	IN 010 : Shoe not available. Available in every color except NX and SS. •	IN T111 : Standard shoe included. Available in every color except SS. •	Standard shoe included. Refer to the Accessories section for more shoe options (additional charge applies). •	Available in every color except NX and SS. •	No decorative collar. •	The pattern is centered for kneewall heights. •	Standard shoe included. Refer to the Accessories section for more shoe options (additional charge applies). •	Available in every color except SS. •	T 010 : Available with wings (see picture below). For any modifications, please contact our customer service. •	T 010V : Not available in 31''. •	T 038 : Not available in 39''. •	Standard shoe included. Refer to the Accessories section for more shoe options (additional charge applies). •	Available in every color except SS. •	T 058 - T 058V : Not available in 39''. •	Standard shoe included. Refer to the Accessories section for more shoe options (additional charge applies). •	Available in every color except SS. •	The pattern is centered for kneewall heights. •	T 011 : Available with wings (see picture below). For any modifications, please contact our customer service. •	T 011-2 : Not availabe in 31", 28" and 32'' for kneewall. •	Standard shoe included. Refer to the Accessories section for more shoe options (additional charge applies). •	Available in every color except SS. •	The pattern is centered for kneewall heights. •	T 012N : Available with wings (see picture below). For any modifications, please contact our customer service. •	Standard shoe included. Refer to the Accessories section for more shoe options (additional charge applies). •	Available in every color except NX and SS. •	The pattern is centered for kneewall heights. •	T 013 : Available with wings (see picture below). For any modifications, please contact our customer service. •	T 013-2 : Not available in 28" for kneewall. •	Standard shoe included. Refer to the Accessories section for more shoe options (additional charge applies). •	Available in every color except NX and SS. •	The pattern is centered for kneewall heights. •	T 014 : Available with wings (see picture below). For any modifications, please contact our customer service. •	T 014-2 : Not availabe in 28" for kneewall. •	Standard shoe included. Refer to the Accessories section for more shoe options (additional charge applies). •	Available in every color except NX and SS. •	The pattern is centered for kneewall heights. •	T 014S : Not availabe in 28" and 32'' for kneewall. •	Standard shoe included. Refer to the Accessories section for more shoe options (additional charge applies). •	Available in every color except NX and SS. •	The pattern is centered for kneewall heights. •	We do not recommend placing 2 identical balusters next to each other. •	T 018-2 : Not recommended for the rear of the tread and not availabe in 28" for kneewall. •	Standard shoe included. Refer to the Accessories section for more shoe options (additional charge applies). •	Available in every color except NX and SS. •	The pattern is centered for kneewall heights. •	Standard shoe included. Refer to the Accessories section for more shoe options (additional charge applies). •	Available in every color except NX and SS. •	The pattern is centered for kneewall heights. •	T 024-2 : Not availabe in 28" for kneewall. •	Standard shoe included. Refer to the Accessories section for more shoe options (additional charge applies). •	Available in every color except NX and SS. •	The pattern is centered for kneewall heights. •	See available starting post: PT 040. •	T 040-2 | T 040-2M : Not availabe in 28" for kneewall. •	T 040-2M : We do not recommend placing 2 identical balusters next to each other. Not available in NX. •	Square hammered spindle on 2 faces (TC series). •	Standard shoe included. Refer to the Accessories section for more shoe options (additional charge applies). •	Available in every color except NX and SS. •	The pattern is centered for kneewall heights. •	T 030C : Availabe in NX. •	T 032C : Not availabe in 31, 28" and 32'' for kneewall. •	Square hammered spindle on 4 sides (TD series). •	Standard shoe included. Refer to the Accessories section for more shoe options (additional charge applies). •	Available in every color except SS. •	The pattern is centered for kneewall heights. •	Square hammered spindle on 4 sides (TD series). •	Standard shoe included. Refer to the Accessories section for more shoe options (additional charge applies). •	Available in every color except SS. •	The pattern is centered for kneewall heights. •	T 036D-2 : Not availabe in 31, 28" and 32'' for kneewall. 37 ¾" I 41 1/2"
•	High-end stainless steel, graded for interior installation only. •	Wood species: birch, maple, oak. •	Before staining, a final sanding is advised. •	Non-standard installation. •	The pattern is centered for kneewall heights. •	Decorative shoe (Z 01) optional. •	Insert included (ZVH 034) except for the following heights : 36", 37 ¾" and 41 ½". •	ZB 01-2 : not recommended for front of tread. Not available in 31", 28" and 32'' for kneewall. 41 1/2" 37 ¾" I 41 1/2"
•	High-end stainless steel, graded for interior installation only. •	For a pattern with a central line in the staircase, use a 36 3/4" and a 40 1/2". •	The welded washer and the shoe are not available in the following heights : 36", 37 ¾" and 41 ½". •	No stainless steel finishing washer is available, you can use the W 023 and W 024 in color GU. •	ZH 020-2 : Not available in 31" •	ZH 020L-2 : Not available in 32"
36 ¾" I 40 ½"
40 ½" 37 ¾" I 41 ½"
•	High-end stainless steel, graded for interior installation only. •	Insert included (ZVH 058) except for the following heights : 36", 37 ¾" and 41 ½". •	Shoe ZH 05 is available as an option (additional charge applies). •	No stainless steel finishing washer is available, you can use the W 025 and W 026 in color GU. •	High-end stainless steel, graded for interior installation only. •	The welded washer and the shoe are not available in the following heights : 36", 37 ¾" and 41 ½". •	No stainless steel finishing washer is available, you can use the W 023 and W 024 in color GU. •	The pattern is centered for kneewall heights. •	ZH 032 : Not recommended for the rear of the tread. Not available in 31, 28'' and 32" for kneewall. 36" 36 ¾" I 40 1/2" 28" I 32"
37 ¾" I 41 1/2" 44"
•	High-end stainless steel, graded for interior installation only. •	Wood species: birch, maple, oak. •	Before staining, a final sanding is advised. •	Non-standard installation. •	The pattern is centered for kneewall heights. •	Decorative shoe (Z 01) optional (additional charge applies). •	Insert included (ZVH 034) except for the following heights : 36", 37 ¾" and 41 ½". •	ZS 01-2 : not recommended for front of tread. 40 ½" 36 ¾" I 40 1/2"
•	For floor installation only. •	Welded washers on top and bottom. •	Same pattern on both sides. •	Standard shoe included. Refer to the Accessories section for other upgraded available shoes (additional charge applies). •	Available in every color except in NX and SS. All decorative collars must be adjusted with an Allen key. B 03D: To be used with TD series and 5/8” bars. Stainless steel. Available with the ZH 058 baluster. 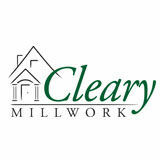 Not available with : newel posts, GT 010, ZB, ZH, ZS, ZT series, 3/8’’ bars and hollow balusters. Accessories cannot be ordered without a corresponding spindle order. BC 01 - BC 01M: Also available in stainless steel. Accessories cannot be ordered without a corresponding spindle order. Additional charges apply. W 03D: Use with 5/8” balusters. •	Available in every color except SS. •	F 08 : Standard shoe included (B 350 P150) •	F 09 : Standard shoe included (B 350 P125) Refer to the Accessories section for other upgraded available shoes (additional charge applies). •	Available in every color except NX and SS. •	Standard shoe included. •	Available in every color except NX and SS. •	Standard shoe included. Refer to the accessories section for other upgraded available shoes (additional charge applies). The 52” model is available only in 3 1/2” (post). •	Wood/metal combination. •	Can be disassembled easily to facilitate staining. •	Available in every color except NX. •	Wood species: birch, maple, oak. •	Before staining, a final sanding is advised. The 52” model is available only in 4-inch width (post). •	Wood species: birch, maple, oak. •	Before staining, a final sanding is advised. CUSTOM RAILINGS All stainless steel products (SS) unpainted and unassembled are available in 48 hours. All stainless steel products are available painted. CUSTOM RAILINGS All unpainted and unassembled stainless steel (SS) products are available in 48 hours. All stainless steel products are available painted. •	Available in stainless steel and in the folowing colors : NT, NU, MU, CU, GU, MR, CM, BW, ACV, NPA, NPO and NPC. For other colors, please contact our customer service department. •	Swivel handrail support and shoe included. •	Handrail supports are glued except for stock orders. •	Screws for the handrail included. Screws for fixing the posts are optional. •	Glass clamps, bars and cable holders can be installed upon request. •	Touch-up sprays are available in all paint colors. •	The included plates are flat unless they are ordered with a round handrail or if specified when ordering. CUSTOM RAILINGS All stainless steel products (SS) unpainted and unassembled are available in 48 hours. •	Available in stainless steel and in the folowing colors : NT, NU, MU, CU, GU, MR, CM, BW, ACV, NPA, NPO and NPC. For other colors, please contact our customer service department. •	Swivel handrail support and shoe included. •	Handrail supports are glued except for stock orders. •	Screws for the handrail included. Screws for fixing the posts are optional. •	Glass clamps, bars and cable holders can be installed upon request. •	Touch up sprays are available in all paintings. CUSTOM RAILINGS All unpainted and unassembled stainless steel (SS) products are available in 48 hours. All stainless steel products are available painted. •	LARGE : 8 mm, 10 mm, 12 mm. •	Use with the posts of the PTR series. •	Maximum length: 236 1/4’’. Can be pre-cut. PTC series. •	Installation upon request. •	Other thickness: Please mention it on your order (additional charge applies). •	Maximum length: 196 7/8’’. Can be pre-cut. ZRK 04B | ZRK 04M •	ZRK 04B-1 | ZRK 04B-2 : For wooden posts (PWTB & PWTL) •	ZRK 04M-1 | ZRK 04M-2 : For metal posts (PTC series) •	ZRK 04M-PP | ZRK 04M-PE : Middle drilling service for metal posts (floor and stairs) •	Not available painted. MCR 168 •	Maximum length: 236 1/2”. Can be pre-cut. •	Cap for the MCR 168 handrail. •	A pre-drill of the handrail using a #16 drill is required. MCC 156 •	Maximum length: 236 1/2”. Can be pre-cut. •	Only available in painted steel. •	Maximum length: 236 1/2”. Can be pre-cut. PTC 200S NU Photos and drawings are indicative. The installer is responsible for checking the current regulations, in their area, with their local building inspector. 4- CONFIGURATION Corner (C) Flat top (K) Extended (A) Lateral (L) Kneewall (M) Glass (V)* Stock (S) Roll (R)** 5- COLOR See the color chart and the price list for available colors. 3- COMPONENT SIZE 2’’ (200) 1 11/16’’ (168) 1 9/16’’ (156) 1 1/2’’ (150) 1 1/4’’ (125) 1/2’’ (050) 3/16’’ (018) * For example, handrail supports fixed to the glass ** Cable sold in one roll Photos and drawings are indicative. The installer is responsible for checking the current regulations, in their area, with their local building inspector. For each project: ▪	Mark the steps on which the posts will stand with a . ▪	Provide vertical measurements between the step with the first post and other steps with posts on. ▪	Provide horizontal measurements from the first step bearing a post. ▪	Indicate tread depth for each step with a post, and average tread depth. ▪	Indicate flight-run. If you want your post to be positioned at a particular spot, please mention this. Otherwise, please refer to the Prestige Metal drawings for approval to know the position of your posts. Impossible configuration Two posts are required. B. Fixing plate Thickness : 1/4"
The use of construction glue such as ‘‘PL PREMIUM’’ is recommended. D. Beam: if (2x10) qty 2 if (2x8) qty 3 B. Fixing plate Thickness: 1/4"
C. A. Finishing Example : wood, gypsum panel... The use of construction glue such as ‘‘PL PREMIUM’’ is recommended. A. B. Fixing plate Thickness: 1/4"
▪ LVL* Step nosing B. Fixing plate Thickness: 1/4"
▪ PARALLAM* Step nosing B. Fixing plate Thickness: 1/4"
▪ GLUED LAMINATED* Step nosing B. Fixing plate Thickness: 1/4"
Step nosing A. B. Fixing plate Thickness: 1/4"
C. Plywood •	Thickness: 5/8" minimum •	Width: wider than or equal to the joist •	H : measure from the finished subfloor to the bottom of the beam •	Screw and glue to the beam. D. 2x10 Screw and glue to the 2x4 or 2x6 wall. C. Plywood E. 2x4 or 2x6 wall •	Thickness: 3/8" minimum •	Width: 36" minimum •	Height: 18" minimum •	Screw and glue to the wall and the 2x10. * It is recommended that the wall reinforcement spans over a minimum of 3 studs. (NON-SHOWN PARTS) 11 31 16"
33" Photos and drawings are indicative. The installer is responsible for checking the current regulations, in their area, with their local building inspector. Hidden ** No screw cover is available for the Tokyo model. Photos and drawings are indicative. The installer is responsible for checking the current regulations, in their area, with their local building inspector.